Leonardo da Vinci was said to be left handed and dyslexic. None of these two facts are relevant when admiring or discussing his work, but his left-handedness should explain the direction of the lines in his shading technique: if you have noticed, in most of his drawings the direction of the lines go from top left to bottom right. In truth, there is no particular reason why anyone should care what shading technique he used, unless you are looking at his drawings in detail and are trying to copy them. One more thought that came to me while thinking of the direction of the shading lines was that of relative points of view. For example, does the world look the same to a short person compared to a tall person? So in this context, would we have considered his sketches differently had he been right handed? (Why would anyone think of this, I don't know but indulge me.) In the end, shading is shading and it gets interpreted by the brain as a shadow anyway, however, the mood of the drawing would probably change depending on these parallel shading lines. Not too much changes: the drawing is still quite beautiful, but perhaps this is a much too simplistic drawing to really feel the difference. Oh well, I guess we'll just never know. By the way, you can read da Vinci's notebooks on-line. (That's too prove that the "internets" are not just about spam and pr0n.) A few years back, I got the chance to actually look at a few pages of the originals. Although it was through a glass cover at the ROM, it was quite a humbling experience. On a final note, it would be insulting of me to assume that using the same technique he used would yield comparable results. However, his technique is copied all around and should be copied all around. Over the weekend, I saw the add displayed to your left. I clicked on it to see who was behind it. As it happened, I didn't win an iPod, but could if I had only given my email address and lot more information I don't even give to gmail or Yahoo. The use of images of political figures is fair game in some instances (have you ever read The Onion? ), however, there are some limits. For example, I can use the PM's image to create my own satirical cartoon and all is well. However, using the seal of the government in any way that could indicate governmental endorsement is a big no-no. So I'm wondering if using the PM's image to peddle SPAM is actually legal? In this particular case, it could be argued that nothing wrong is happening as the question being asked is of public interest and when talking about the man why not use his likeness. As an interesting note, though, I'd think Apple would have more of an issue in this advertisement with the use of an actual iPod. Those guys are really defensive when it comes to their IP (and so they should). So my question is to Steve (as he is known to Mr. George W. Bush), does it bother you that your image is used in this way? Even Andi played around with Che's most memorable photo. Some would like to think that he was heroically looking into the future, but real life is less romantic: he was actually listening to someone speak while at a memorial service on March 5, 1960. Most people change little things from the original image to serve their comercial purposes. Note how tilting the pose gives it a more interesting look, which is, by the way, the one we are most familiar with. My drawing seems a bit distorted because of my picture taking skills. I tried to fix it with Fireworks, and it gave it a funky look, which I don't entirely dislike. 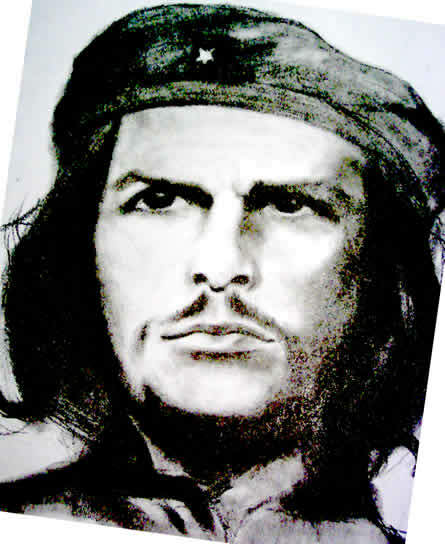 What's my take on el Che? I will wait to see what history has to say about him, however, there is no denying that he was one of the icons of the 20th century. Moreover, he was loved and hated everywhere. 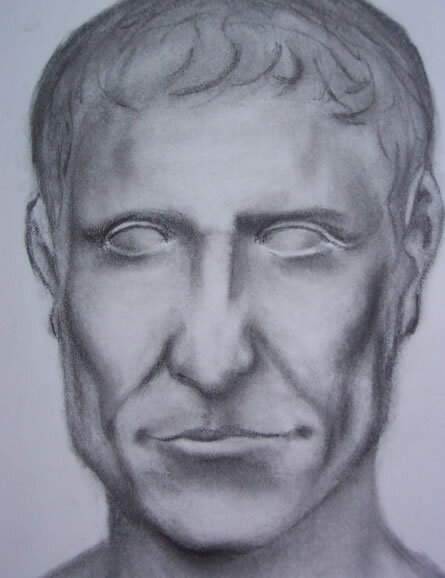 No body knows what Julius Caesar really looked like. Most of the surviving marble busts of Roman emperors are actually idealized versions. The picture above is actually an inverted version of the original drawing. 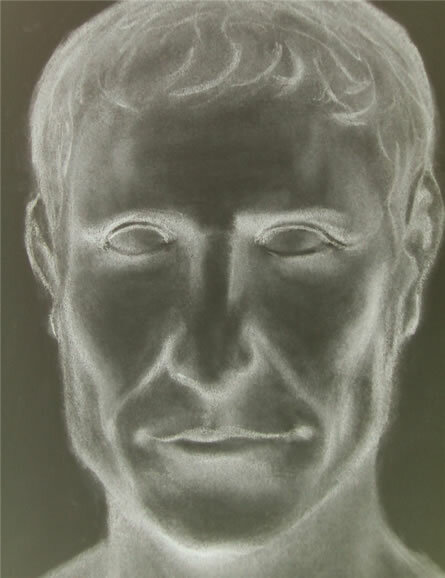 I haven't drawn in a while so my rendering is a bit awkward (I would even say childish), however, once I inverted the image, the solidity and the strength of the idealized squared jaw of the once most powerful man in the known world took an interesting depth I wasn't expecting. My josesandoval.com hosting service has a basic web log analyzer. I check it once in while to see where people are coming from and to modify certain things. One of the most overlooked content optimization tools is your web log. If you want to use your site for any comercial purposes, you need to analyze the logs in order to customize your content. New age marketing gurus keep saying: "work from the outside-in." Meaning, understand your customers first. What are my customers looking for? By far, the most popular page is my resume. I have reached the "advanced training" sessions. I have only 3 more sessions to go in a set of 12. I keep writing that my reading speed has increased because I see the numbers and the progress chart display an almost linear increasing trend. Am I skeptical? Well, the evidence seems to indicate progress, but I have noticed that I keep "reading" faster and faster but I don't seem to recall "everything" I read. I do remember the gist of the paragraphs I read, but not everything, everything. I kind of expected it. Perhaps with more training I'll learn to recall more. I don't think many of you would recognize, let alone remember, the name of this company (AdExact). I'm only remembering it today because I just read that google is getting into the targeted TV advertising business. As a matter of fact, AdExact tried this whole premise of targeted TV advertising--I think they were successful to a point, but in the end they ran out of money and closed down shop. The company was started by PixStream founder Stephen Bacso, after Cisco bought them (nice guy, he plays soccer in a couple of city leagues; by the way, he kicked me really hard once--part of the game, I guess). AdExact went through a couple of CEOs before going out of business. At the beginning of their story they managed to generate quite a buzz because of the Bacso legacy and, mainly, because it was a really neat idea and VCs were willing to give them money. However, I think they were too early in the game with their product. If they could have known: I think google would have acquired them, similar to Reqwireless (another local high-tech shop), had they stayed afloat for another 3 years. I wonder what happened to all that technology and know-how? I'm sure most developers got absorbed by the Waterloo market, but I haven't seen any of them (I knew a couple from my days as a co-op at HP Waterloo), except for Bacso who kicked me, and went to become CEO of some local Waterloo company. I have a feeling that google will probably make it work with all their mighty clout and loads of cash in the bank--and perhaps the timing is better. Does anyone know what the rules are to revive failed companies' business models? I really like Enron's on-demand broadband service model. Television advertising. Now it's a whole new ball game. ADexact uses technology to transform cable and wireless channels into precisely targeted delivery mechanisms. The result? A new way for advertisers, broadcasters, and network operators to target information and increase the effectiveness of television advertising. Now messages can be targeted to television viewers based on a combination of fine-grain subscriber information, profiles, viewing activities, and subscriber-registered interests - all in a secure and audited environment. ADexact brings together innovators from eBusiness, telecommunications, and digital television to provide the unique expertise required to make ADexact the leader in targeted advertising solutions. We integrate targeted advertising, content, and information with the attention-grabbing power of television to deliver advertising messages more effectively than ever before. Savant syndrome is a rare, but extraordinary, condition in which persons with serious mental disabilities, including autistic disorder, have some "island of genius" that stands in marked, incongruous contrast to the overall handicap. My quest into speed reading was actually inspired by Daniel Tammet and Kim Peek. Having an interest in Mathematics, I find Tammet's ability quite remarkable. He doesn't calculate arithmetic problems the way you and I would, he sees and feels the answers. Hence, any type of arithmetic problem just comes to him in his mind without actually doing anything. For more remarkable human potential, check out all the recorded cases of Savantism at Savant Syndrome: Islands of Genius. Woody Allen once said, "I took a speed-reading course and read War and Peace in twenty minutes. It involves Russia." Funny stuff. Anyway, I saw decrease in my reading speed after training session number 8: from 464 to 451 wpm. I have had conversations where the question of "What is Web 2.0, anyway?" has been thrown around. As usual, I have to give my point of view and I say: "web applications that let you do crap around them and take advantage of organic growth, collaboration, blah, blah..."
I don't think I am wrong but I don't know if I am right, as there are way too many definitions of this term. People seem to use the one that is most conveniently related to the theme they are discussing. This fact, however, doesn't stop people from writing more definitions. Take for example, 10 definitions of Web 2.0 and their shortcomings. I think my version is represented in #2 in the list. As promised by the infomercial, my reading speed keeps improving. I haven't timed myself outside the program's testing tool, so I don't know if I'm being fooled, i.e., the program keeps telling me I am reading faster without actually doing so. It's like the question the witch keeps asking the mirror: "who's the fairest of them all?" It's always her, but somewhere along the story there is a catch. I will try a reading test sometime in the next couple of days using a real book. For now, this is the timing process the program uses: first, press the space bar to display a book passage and start the timer, and second, press the space bar again to stop the timer and calculate the reading speed. It goes without saying that it is extremely easy to code this timing algorithm: display X amount of words in a text passage of some sort, then time how many seconds it takes to read (the space bar stops the clock), and, finally, divide X by the time and multiply the result by 60 to get minutes. Whatever words per minute (wpm) the result is, there has to be some fudge error added to the result because the program needs to account for the time it takes the user to click the space bar, i.e., it could take between 0 and 1 second to do so--however minor, this time has an effect in the results. Anyway, this is just the software developer in me talking, but I'm actually surprised there aren't more, similar, "speed reading training" applications around. I'm sure some things are copyrighted or trade marked, but the line between copying and reverse-engineering is very, very thin. Note that I am not implying I want to copy the process and make my own product. I can't really see myself hosting an infomercial in the stile of Mike Levey, who actually past away in 2003. On a final note, it took me a long time (in internet minutes, around 5) to find a Mike sweater picture. I have noted that it's hard to find pre-internet (1992) information on the internet, so someone should start internetizing old information. Man, these are some sweet sweaters. By the looks of this lesson's progress chart (session 6), my reading speed has increased from 230 wpm to 360 wpm (this is my before training session score). Not too shabby, but reading regular books still feels the same and I haven't timed myself while reading leisurely to see if I have actually improved. I have noticed, though, that I can turn my freaky speed reading ability at will, but it doesn't feel natural. Although I can still retain what I read, I don't think I could speed-read a whole book just yet--it seems to be too tiring and requires too much concentration. I have come to see this speed-reading techniques like walking and running: I could actually run through the park on Sunday afternoons, but what would be the point of that when a slow stroll is much more enjoyable. In other words, with great speed-reading powers, comes great reading responsibilities. As usual, I have my own points of view on this particular book and I'm not afraid to express them: on the one hand, it is a good read because it has good explanations of technical subjects; on the other hand, this book may not be for everyone (leaving aside the fact that it is targeted to a U.S. audience): although the author has made every effort to write simple and coherent sentences about a subject that requires in-depth knowledge of finance theory, some explanations seem light because of the fact he has used simple and coherent sentences, i.e., he can't explain every technicality as to appeal to a broader audience. Don't take me wrong, most of the themes are not hard, but if you come from a non-finance background and you are able to understand CAPM or bond yields just from one read of this book, my hat is off to you. Note, however, that Malkiel seems to know what he is talking about and the book's main theme is the one of diversification. I think everyone can understand that well diversified investment portafolios reduce overall risk. In such cases, who cares if you can or can't calculate the standard deviation of your returns (which is, according to Modern Portfolio Theory, the overall risk). Anyway, I have tried to speed-read through a couple of pages, but, like I said, it is very taxing and I end up slowing down. Perhaps with more practice I can speed-read a whole chapter. I was on vacation at a cottage in Grand Bend two weeks ago. Aside from going back to my natural colour (winter lightens me), I noted two things of importance: first, the world doesn't stop because I am not around; and second, TV network programming across the country is all the same (literally). Grand Bend is located at the edge of lake Huron. It is a touristy town with a population of 1,067. Spending time there feels like detaching from the "real" world. The happenings of society seem inconsequential. I had to really make an effort to inform myself of the goings of the world, which brings me to monotony of the news in the country. The big TV networks such as CTV, City TV, and Global feed the same product, respectively, to most regions in Canada. These networks have the business of selling news and commercials down to a formula that can be copied from region to region, city to city, and small town to small town. Although there are "national" programs that are played unchanged in every region (CTV News or W5, for example), "local" programming, which is news mostly, is only varied by the newscasters and minor local content--the backgrounds, music, and color schemes of the studios stay the same. This sameness seems freaky while away because it feels that it doesn't matter where you are everything is the same. So I watched Alberta local news and everything seemed normal to me: cops were arresting people, the local baseball team won, there was a fire on King street, etc., etc. I felt like I belonged because I was equally scared of the same demons the whole nation was, however ironic, I was only surrounded by 1,064 peaceful Grand-Benites (note that people around beaches and the sun are much more friendlier than city folk). Aside from being fed the same stories as the rest of the nation, however abnormal all these rehearsed scripts, music, and uniformity in backgrounds seem, from an Operational and Statistical Quality stand point of view, the monotony makes sense. If I owned a large network like CTV, I wouldn't do anything different. And they don't: network TV is consolidated and owned by few hands (or corporations), hence, it is in their best interest to be the same everywhere. The secret is to control variability across each region. Why? It's always variability that screws things up by reducing the quality of anything manufactured. I wrote about this in a Software Engineering context, but the news world abides by the same principles: control variability; manage quality. Variability control comes in two facets: social control, and operational control. There is too much that can be said about the first, and for this entry I am only interested in the latter. So this is my operational analysis: the franchise model used by large networks because it is easy to implement everywhere. 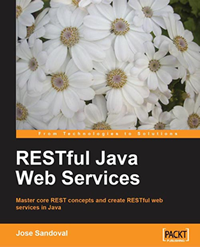 The model is cross functional, expandable, and transferable. I look at it like the McDonalds model: you always know what your getting as soon as you see those golden arches. So when the franchise model is implemented to sell ad space on TV, you know what you'll be getting whenever that music starts playing at night. One question I asked myself after watching Alberta news was that if I was better informed or better off than I was before watching TV that day. I concluded that I was not. I was only slightly anxious about everything around me. This is one of the reason I don't have cable (or drink coffee). I should say that my simple analysis is based on observation only; I haven't worked for a TV station, ever. My media experience is limited to a contract I did at The Toronto Star online newspaper, in Toronto, and it was purely a software development role. I really don't know how they make all newscasters sound the same. I think broadcasting schools have special classes to teach the intonation and elongation of words according to news "genre." If students want to specialize in sport's broadcasting they need to speak fast; for regular news, students learn to have a concerned face and speak in specific tones and put the emphasis of every sentence in the last 2 or 3 words; for weather forecasting they probably teach students how keep arms moving at all times to the green screen on the back. According to a wiki article, "National Geographic says that Grand Bend has one of the 10 most beautiful sunsets in the world, which is thought to be attributable to the high levels of particulate matter that flow into the area from the Ohio Valley." I really don't know if this is true, since the article doesn't have a specific National Geographic reference. However, I can serve as witness that the sunsets two weeks ago were quite extraordinary. I said that I was going to plateau at some point, but I didn't think it would be so fast. My training session today didn't go that well. My score after the training exercises actually decreased. It went from 314 w/m to 305 w/m. I can only guess why it went down. I am rationalizing the decrease due to the subject of the passage to read after the training session. It was about Greek philosophy and found myself trying to associate all the names to actual events. It was happening really quickly and I couldn't help it. We'll see how it goes in the next few session left. These are the results for session 3. It looks like my reading speed keeps increasing. I have noted, though, that I want to keep beating my old scores. Apparently, it has become a competition with myself. Can anyone be trained to read really fast? Speed Reading Training, part I. Speed Reading Training, part II. Speed Reading Training, part III. Speed Reading Training, part IV. Speed Reading Training, part V.
Speed Reading Training, part VI. Speed Reading Training, part VII. Speed Reading Training, part VIII. Speed Reading Training, part IX (final). I read on the news of some arrests that happened in the UK early today. You probably heard something about it, too. Due to these arrests, a few security agencies went into high alert and decided to introduce new commercial flying rules that estipulate that anything in a tube or liquid container must not be carried into a plane. This means that there will be a large number of tooth paste tubes being thrown out. It is clear that these products, whether they are tooth paste, water, or sports drinks, will have to be replaced at some point. Who benefits from these extreme (and perhaps needed) measures and all the wastage? It's a moderate change of 1.21% of their stock price, but it is moving up. The market opened at $59.60 and closed at $60.26. There will be other companies that will see a bit of a jump on their stock price because of these new rules, but that is left as homework for you to figure out which particular products are being thrown in the garbage. It is a bit cynical to point this out, however, our economical system is quite complex and everything is tied to everything, including fear. But I'm sure you already knew this and probably made the connection as soon as those mini mouth-wash bottles were hitting the bottom of those airport garbage cans. Too bad I don't have any of these stocks. I've always been curious if humans can actually read at super speeds as sometimes shown in TV and movies. For example, the way some Savants are claimed to read a full page from a book in a matter of 3 seconds or so. One of the problems I see with reading super fast is that comprehension of what has been read goes down, which, to me, is the main purpose of reading anything, i.e., to learn or be informed. So I would find of very little use if I can read a full page in 3 seconds and only understand 10% of the text. Note that sometimes even taking 2 or 3 minutes a page of books with esoteric Accounting concepts or Yield Structures Curves I still end up understanding only 10% of it. As usual, I am running an experiment on myself to see if I can actually learn to read faster than I currently do and still maintain relatively good text comprehension. My goal is not the amazing 3 seconds per page, but I want some kind of improvement. In order to become a super-fast reading machine, I started one of those "read fast and enjoy life" training programs. I will not give the name of the product I am using, but, like all the other ones, it is based on eye muscle training and scientific research (they have a picture of guy wearing a lab coat, so it must be legitimate...wink, wink). For each lesson, there is some excerpt of text presented to test the reading speed before and after. The results (in words/minute) are used to plot the graph above. So far, my reading speed has increased after each exercise, however, I don't know if it is the actual exercises that have increased my reading speed or the text presented after each lesson is easier to read. What I mean is that I don't know if the complexity of the second passage is lesser than the first, i.e., smaller words and simpler sentence structure. However, my commas don't cost me $2.13 Million yet. Ouch. I would think some lawyer got his or her hand slapped for this extra character. [The agreement] shall continue in force for a period of five years from the date it is made, and thereafter for successive five year terms, unless and until terminated by one year prior notice in writing by either party. If you don't see it right away, the "bad" comma is the one before "unless." 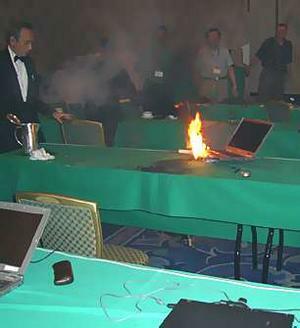 I bet these laptops are part of the super secret agent models not available to the rest of us. However, I definitely do not want one.